If your school or district blocks access to our YouTube videos, you may want to hide that content so that it is not an option your students can see when selecting an activity. From the top navigation bar, click Menu. In the sidebar that opens, click Account Settings. Toggle "YouTube videos" from On to the Off setting. 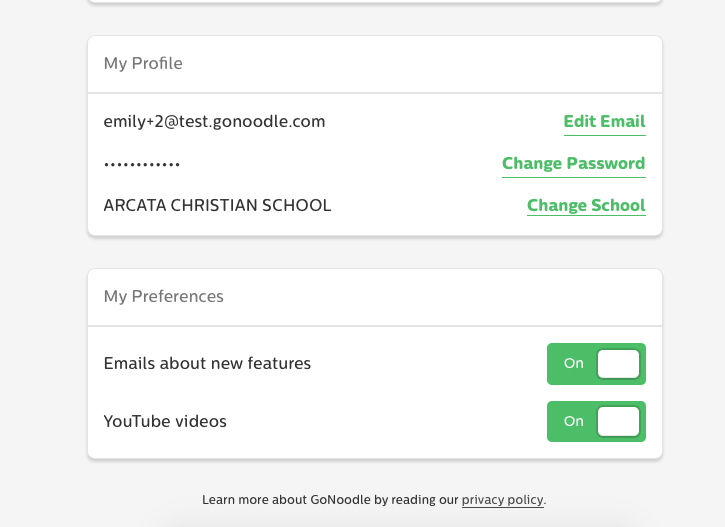 With "Show YouTube Content" set to Off, YouTube videos will no longer appear in any view of GoNoodle activities, including Channel, Explore, or Search. You can set "Show YouTube Content" to On at any time by following the instructions above.